CUT TO SIZE ... at no additional Charge ! 3000+ standard / non standard sizes from 2x2 to 14x18 ... custom-cut to size ... at no additional cost ! Over 3000 Sizes ~ Sold in Pack Quantities Lightweight yet sturdy. A quality white-core foamboard for most of your art needs. A favorite with Artist's ... Business Offices ... School Teachers and Craft Makers. Over 3000 Sizes ~ Sold in Pack Quantities Lightweight and extremely rigid with an ivory white mounting surface. Perfect for your quality artworks, digital pictures, photographs and documents. Over 3000 Sizes ~ Sold in Pack Quantities Lightweight and extremely rigid with a smooth black mounting surface. A classic Black on Black quality material that adds an elegance to your artworks. Perfect for artwork, photographs, documents, picture framing & graphic displays. 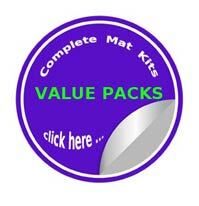 Over 3000 Sizes ~ Sold in Pack Quantities Self Adhesive Foamboards. Initially repositionable ... permanent after 24 hours. Neutral pH adhesive A simple solution for Artist's ... Businesses ... School Projects and Arts & Craft Makers.